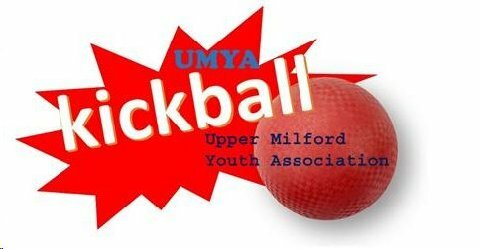 Kickball is Upper Milford Youth Association's most relaxed sport. Games are played at Lenape Park; no practice, just pick up teams and go. Children age 5-12 are eligible, no residency restrictions. We try to divide into at least two games -- one for the younger kids and one for the older kids. Parent/Guardian participation is encouraged in every game. For example, we always need 1st and 3rd base coaches, and infield coaches. Please make sure you let me know when you get your clearances, if you want to help out. Every kid gets to play: it is UMYA's motto! First game is July 10, last game is August 17. Rain happens. Drizzle in the summer, we like to play in it. But, lightning and/or downpours, not so much. New for 2018: Rain day is the next day, same time. If you cannot make a game, you will be missed. Just let me know so that I can arrange the roster. For further information, contact the UMYA Kickball Coordinator, Charalambos [sounds like kara-lamb-boss] aka Harry Marangos at [sounds like zeff-ee-ross]. Cost for kickball is $25 per child. If you have not played any other UMYA sports this year, you would need to pay the $20 family membership fee for 2018. UMYA is different from others in that this family membership fee is paid only once-per-family-per-year for all sports. We, as in UMYA Board, Sport Coordinators, and Volunteer Coaches, are always on the lookout for volunteers for sports coaching and for board members and coordination. Please reach out to me or any board member for details. It is extreemly satisfying, sometimes frustrating, but you get to be with your daughter(s) or son(s), playing through the seasons. Looking forward to seeing you at the fields. PS. We use the http://www.umya.org website to register. I believe that you may have to go to the full-site to register, not the mobile version -- it is easier on the eyes and with more functionality. On the left of the screen is the Registration Menu, click on it, and follow the instructions. If at any point you have any issues, please do not hesitate to contact me.